Directly from the introduction: "Cytochrome c (Cytc) is a small (12-kDa) globular nucleus-encoded mitochondrial protein containing a covalently attached heme group with multiple functions. In the electron transport chain (ETC), it functions as a single electron carrier between bc1 complex (complex III) and cytochrome c oxidase (CcO, complex IV) and is thus essential for aerobic energy production. The second important role of Cytc is seen under conditions of stress, when it functions as a crucial pro-apoptotic signal (1). During apoptosis, Cytc is released from mitochondria into the cytosol, where it interacts with Apaf-1 to form the apoptosome, which in turn activates caspase-9 and the downstream executioner caspase cascade. Furthermore, Cytc functions as a cardiolipin peroxidase during the early phase of apoptosis, when it oxidizes the mitochondrial membrane lipid cardiolipin, thereby facilitating its own release from the inner mitochondrial membrane. In contrast, under healthy, non-apoptotic conditions, Cytc acts as a scavenger of reactive oxygen species (ROS) , and it takes part in other redox reactions inside mitochondria, including redox-coupled protein import and reduction of p66Shc, a protein that is implicated in the generation of ROS and apoptosis. Given the multiple functions of Cytc, it is not surprising that it is tightly regulated." These questions deal with its regulation. 1. The investigators purified bovine kidney cytochrome C, done in the presence of phosphatase inhibitors, from bovine kidney. Figure A below shows electrophoretic (PAGE) results for the purification as described. Lane 1, purified kidney Cytc; lane 2, commercial cow heart Cytc; lane 3, ovalbumin; lane 4, EGF-treated A431 (a human carcinoma cell line) total cell lysate. Top, Coomassie gel; bottom, anti-phospho-Thr Western blot. The results are shown below. a. Why did the investigators include commercial cytochrome C and ovalbumin in their electrophoresis experiment? Commercial cytochrome C would presumably NOT be phosphorylated as there would have been no reason to have added phosphatases to the prep to preserve the phosphorylation state of the protein. Ovalbumin serves as a negative control - it's a secreted protein which not be phosphorylated. b. Interpret the results of the Western blot. What conclusions can you draw? The purified kidney cytochrome C is phosphorylated on a Thr side chain (as shown in Lane 1 of the Western blot), but commercial CC and ovalbumin (negative control) aren't. A band with the correct MW (=CC) is phosphorylated in the A431 cells. One tryptic peptide fragment of cytochrome C that was phosphorylated has this sequence: HKTGPNLHGLFGR. To study if this fragment is phosphorylated, the investigators performed a mass spectral analysis (review). The figure below shows the fragments and labeling systems used to denote MS/MS fragmentation peaks. d. The phosphorylation site was unambiguously assigned by fragment ions y10 and y11. Use the MW tool above to determine the MW of the dephosphorylated y10 and y11 peaks (since the actual data is not available). Which amino acid is phosphorylated? MW of y11 (TGPNLHGLFGR) = 1168.32 ; y10 (GPNLHGLFGR) = 1067.22 . The difference between these should be the MW of the amino acid phosphorylated = 101.1. This is the MW of an internal Thr in a protein sequence. The actual m/z for the y102+ peak was approximately 534 so y10 is approximately 1068.
e. The in vivo activity of phosphorylated cytochrome C oxidase (CcO) was measured. What are the substrates for the enzyme? A graph of CcO activity vs [Cytochrome C] is shown below. What effect does phosphorylation have on the activity of the enzyme? The substrates are O2 and cytochrome C (2+). f. A high resolution PAGE gel of the purified cytochrome C shown in the absence (lane 1) and presence (lane 2) of an added nonspecific phosphatase can be seen in Figure D below. Western blotting with an anti-phosphothreonine antibody is shown in the below panel. What do the bands show? What percent (approximate) of the purified cytochrome C is phosphorylated? Why is the result important for the physiological role of the post-translational modification? The upper band in Lane 1 of the Coomasie-Blue stained gel is phosphorylated cytochrome C. The lower band is unphosphorylated which has the same MW as the dephosphosphorylated form. It appears that about 80% of the purified cytochrome C is phosphorylated, a very high percentage which suggests physiological relevance. e. If cytochrome C oxidase is inhibited by phosphorylation in vivo, what effect would this have on oxidative phosphorylation? Formation of reactive oxygen species (ROS)? It would decrease both the rate of ox-phos and the generation of ROS. 2. Site specific mutagenesis allows changes in single amino acids in a protein sequence to determine the functional properties of the amino acid. a. if phospho-Thr 28 (pT28) is important for regulation of CcO, to which amino acid would you mutate T28 so that the mutant would have the same effect on CcO as pT28? Explain. b. Investigators made the following mutants, T28E and T28A. Why did the makes these mutants? What activities might they have. Would they be phosphorylated in vivo? T28E is described above. It would mimic the charged state of pY. T28A is a neutral side chain and would mimic the unphosphorylated state. Neither could be phosphorylated by typical kinases. c. Circular dichroism spectra of wild type (WT), mutants, and commercial cytochrome C were determined (shown below). Why did they perform these experiments? What did they show? 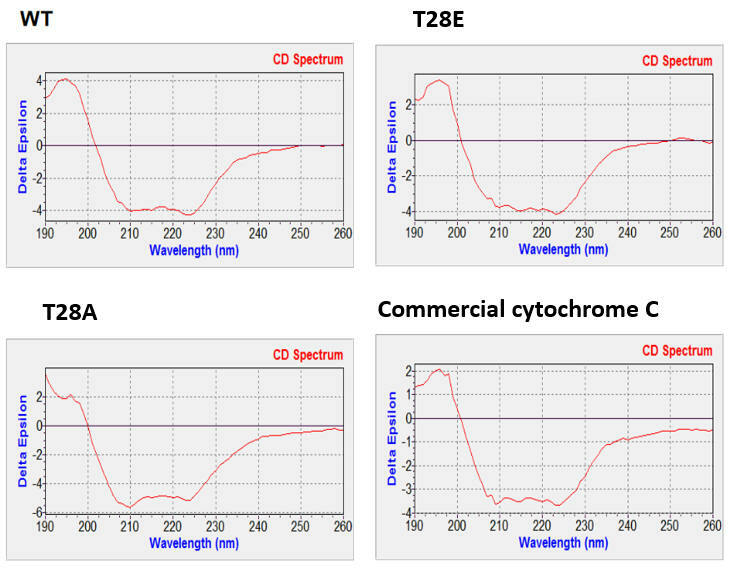 CD spectroscopy shows the the extent and type of secondary structure. They wanted to determine if the mutants had similar secondary structure and by extension probable similar tertiary structure as the WT. d. The WT and mutant proteins were expressed in E. Coli. Would you expect them to be phosphorylated in E. Coli? No. E Coli probably has few Thr and Tyr kinases and not recognize the phosphorylation motifs in eukaryotic protein sequences. e. The standard reduction potentials of the WT and mutant enzymes are shown below. The mutants' values are similar to that of phosphorylated cytochrome C. Are the mutants better or worse oxidants than the WT? Since they are less positive, they are weaker oxidants. f. The activity of the WT and mutants were examined in an in vitro assay with CcO. The results are shown in C below. Describe the similarities between T28E and the natural pT28 versions of cytochrome C. What might account for the approximately 20% higher in vitro activity of the purified pT28 cytochrome C? Only about 80% of the purified protein is phosphorylated (see above). The extra activity arises from the unphosphorylated protein. g. Cytochrome C can gain or lose electrons at its heme as well as be oxidatively modified within the protein structure itself. As such it can act as a ROS scavenger. Describe how cytochrome C might react with superoxide, O2-? hydrogen peroxide, H2O2. With superoxide it would gain an electrons (acting as an oxidant) to convert superoxide back to O2. It would be oxidized by H2O2 and converts it to water. h. Figure E below shows results when ferro-(Fe2+)-Cytc variants were treated with low levels (100 μm) of the ROS H2O2. Which reacted with H2O2 faster? Which are more protected from reaction with the ROS? At high levels of H2O2 (3 mM), damage can occur to the protein, which can be monitored by changed in heme absorbance (Fig F below). Comparing the T28A and T28E mutants, what structural feature of T28E might protect it from reaction with H2O2 as evidence by both Figures E and F? The T28E phosphomimetic mutant was oxidized at a rate similar to WT Cytc, whereas the T28A mutant was oxidized at a 2.7-fold higher rate (Fig. 2E). After the addition of excess H2O2 (3 mm) T28E Cytc was more resistant to degradation by excess H2O2 than the wild type, whereas the T28A mutant was degraded more rapidly (Fig. 2F) suggesting that the introduction of a negative charge in position 28 stabilizes the protein. i. Ferri-(Fe3+)-Cytc variants were reduced in the presence of 200 μm ascorbate. The results are shown below. Which form is a better scavenger of electrons? T28E Cytc was reduced at about twice the rate of WT or T28A Cytc, suggesting that it can act as a superior electron acceptor and scavenger. 3. Crystal structures of the WT and mutants shown them to be almost identical. To explore possible differences in their solution structures, molecular dynamics simulations were performed on the three protein structures as well as on a model of phosphorylated Cytc with the phosphate group added to Thr28 in the WT chain. The figure below shows RMSF (a measure of the average atomic mobility) of backbone atoms at 0-100 nanoseconds of simulation and 100-200 ns. What structural information can you derive from these results that could account for the results described above. 4. To test the effect of phosphomimetic substitution of Cytc in intact cells on mitochondrial parameters, the investigators generated cell lines stably transfected with empty vector control and WT, T28E, and T28A Cytc, using mouse lung fibroblasts in which both the somatic and testes-specific Cytc isoforms have been knocked out. Determination of cell growth showed that WT and T28E Cytc-expressing cells grew equally well, whereas T28A Cytc-expressing cells showed a 27% reduced growth rate versus WT. a. Figure C below shows the oxygen consumption rate (OCR) for cells tranfected with an empty vector (EV), WT or mutants. Are the results in C consistent with results described above? Figure D shows the signals from a probe, JC-1, whose fluorescence changes with the transmembrane potential across the inner membrane, ΔΨm. Explain these two results. 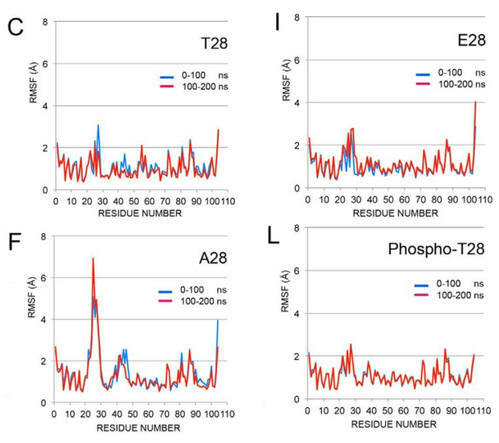 Strikingly, cells expressing T28E phosphomimetic Cytc showed 60% reduced respiration rates (Fig. 4C), matching results obtained with purified CcO in vitro (Figs. 1C and 2C). This finding is of importance because it suggests that a modification of the small electron carrier Cytc can control overall flux in the ETC, a scenario that has not been reported or considered in the past. Consequently, a reduction of the respiration rate should translate into a reduced mitochondrial membrane potential ΔΨm. 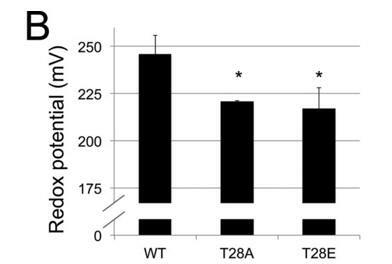 Analysis with the voltage-dependent probe JC-1 showed that T28A- and T28E-expressing cells showed 15 and 31% reduced fluorescence compared with WT (Fig. 4D), indeed indicating a reduction of ΔΨm. b. What effect would expect on the rate of production of ROS by complex I and III in the cells transfected with the T28E mutant? On ATP levels? Explain. Given the direct connection of ΔΨm with ROS production at complexes I and III (18), we predicted that T28E Cytc-expressing cells should exhibit reduced ROS levels. Using the mitochondrial ROS probe MitoSox, we found that fluorescent signals were reduced by 35–40% in cells expressing T28E and T28A Cytc compared with WT, indicating reduced ROS levels (Fig. 4E). ATP levels were reduced by 6 and 28% for cells expressing T28A and T28E, respectively (Fig. 4F). c. To test whether cells expressing T28E Cytc are better protected from H2O2 exposure, cell viability was determined after treatment with H2O2. What would you expect? Increased viability would be expected, at least at low H2O2 levels as the mutant is more resistant to oxidation by it. d. The actual results are shown below. Explain the results. Are they consistent with your answer above? T28E Cytc-expressing cells showed higher viability when treated with a low concentration of H2O2, but viability matched with WT Cytc-expressing cells at higher H2O2 concentration (Fig. 4G). This observation suggests that T28E Cytc protects the cells from mild oxidative stress. These data suggest that modification of Cytc Thr28 regulates ETC flux, which in turn affects ΔΨm and ROS. 5. What kinase phosphorylates T28 in vivo? a. List some and suggest a candidate whose activity might be important in energy regulation (see Chapter 9). Any one in theory that is localized in the mitochondria. "MAPKs, Akt, PKA and PKC are present in mitochondria, particularly in the intermembrane space and inner membrane". b. Use Scan Site 3 to predict what might phosphorylate T28. Use P62894 for the accession number for bovine cytochrome C and low stringency. (T28 will be referred to as T29 with the N-terminal Met in the newly synthesized protein given the number 1). 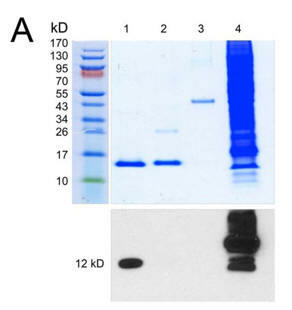 c. To see if AMP Kinase (AMPK) phosphorylates cytochrome C, investigators added AMPK and ATP to bovine heart cytochrome C. The results of PAGE gels and Western blots are shown below. What is the role of ATP in Figure A? Figure B was performed in the presence of ATP and of AMP. What is the role of AMP? Interpret the results. ATP is a substrate of the enzyme AMPK. AMP is an allosteric activator. The Western blot in A shows AMPK phosphorylates Cytochrome C on a Thr side chain. Panel B shows that the phosphorylation is activate by AMP. d. MS analysis show the modification to occur on T28. What effect might have occurred if increasing amounts of T28A or T28E were added to the reaction? If these mutants bound to the AMPK, they would inhibit the reaction in a competitive fashion. 7. Does AMPK act as shown above in kidney cells? Investigators added an activator (A769662) and an inhibitor (Compound C) of AMPK in mouse kidney tissue and looked at the effects on phosphorylation of Cyto C (Figure D) and mitochondrial respiration (Figure E). Interpret the results. IP stands for immunoprecipitation. 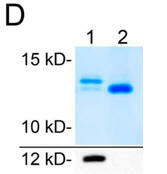 In this case, an antibody against CytC was added to precipitate it. WB stands for Western Blot. In D, it is clear that the antibody precipitates Cyto C, as detected by the WB: CytoC, and that cells grown in the presence of the AMPK activator A769662 robustly phosphorylate Cyto C. Compound C, an inhibitor of AMPK, has the opposite effect. Panel E shows that when Cyto C is phoshorylated (in the presence of A769662 activated AMPK, respiration rate as measured by O2 consumption, decreases, paralleling results shown above. Summarize the results of this paper. Here is a link to the abstract.